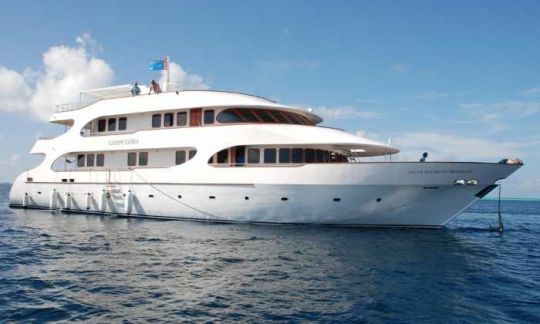 Meaning "seize the day" in Latin, Carpe Diem is a spacious 35 metre steel hull luxury Maldive Islands liveaboard with great facilities. 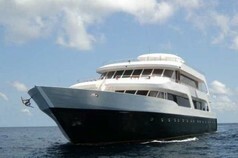 It operates 7 night diving trips regularly and occasional 10 night cruises. 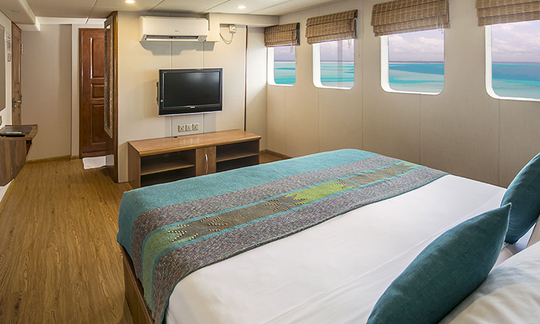 Up to 20 guests can be accommodated in en-suite cabins ranging from Suite to Standard in a broad range of prices with several featuring personal TV and DVD players. 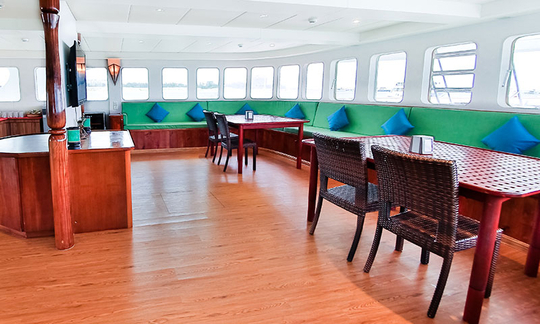 There is a lounge with TV, DVD and music system and a bar for those 'apres dive' sundowners. 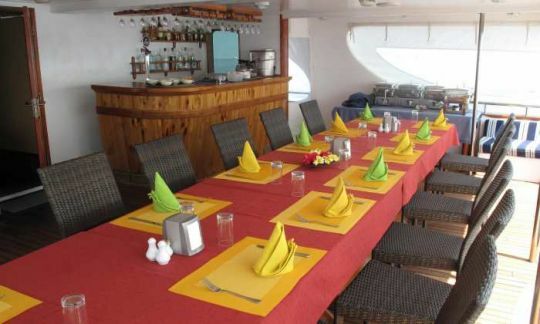 Cruise guests mostly prefer to dine in the open air dining area on the upper deck, eating indoors in the dedicated dining room only in inclement weather. Big windows are a feature of the boat so there is always plenty of natural light, especially in the saloon and in the upper and main deck cabins. There are also plenty of shaded outdoor areas for those who prefer the sea breezes but not the exposure to the sun. 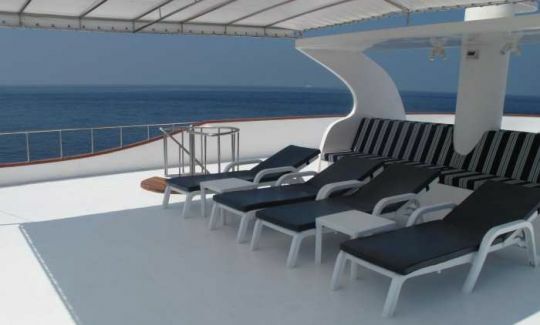 The sun deck itself is huge and, with shade and seating, is a social area doubling up as a salsa dancefloor at times. Diving takes place from the dhoni which has 3 points of entry and egress, helping the dive groups to avoid landing on top of each other. Enriched air certified divers will appreciate complimentary nitrox. 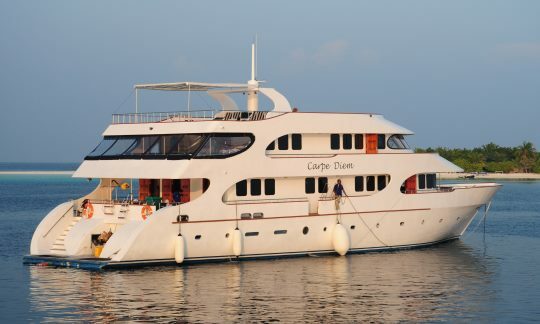 With a less intensive 3 dives per day itinerary, MV Carpe Diem is a sleek and attractive boat which promises more relaxing liveaboard trips around some of the Maldives best dive sites in comfort. If this is your style then maybe you should seize the day and make your dream diving cruise happen! Special offers: Early bird specials: Save 15% when you book 360 (or more) days in advance and save 10% if you book 180 - 359 days in advance! Last minute specials: Save 10% on trips confirmed within 30 days of departure! Notes: Recommended diving experience (not mandatory): Far South trips participants should be Advanced Open Water Diver certified with at least 100 logged dives. For all other trips guests should be at least Advanced Diver certified, or Open Water Diver certified with a minimum of 100 logged dives and experience with current dives. Divers with less experience will be able to join trips but may have to sit out some dives if dive certifications are not sufficient for the planned dives, unless they take the Advanced Open Water Diver course onboard. Cruise price per person includes: Cabin accommodation with air-conditioning, breakfast, lunch, dinner, snacks, drinking water, hot drinks, return transfers to the boat from Male Airport at scheduled times, dives (as detailed in the trips above), experienced English-speaking divemaster(s) (8 divers per guide), SMB, tanks, weights and weight belts, nitrox fills for enriched air certified divers (only for trips starting May 2019 onwards), 12% GST on cruise price. Cruise price per person excludes (mandatory, unless customer provides own): Scuba equipment (approx. US$ 247 for 7 nights, US$ 336 for 10 nights), dive insurance. Some of the listed trips might include snorkelling at Hanifaru Bay (park fee of US$ 20 per person). Green tax (US$ 6 per person per night) payable in advance, domestic flights (if required), GST on all items and services purchased on board. Unless otherwise stated, all the listed items need to be paid on arrival (cash: USD or EURO, or credit card). Optional extras: Soft drinks, alcoholic drinks, torches, reef hooks, airport transfers outside of scheduled times, nitrox fills for enriched air certified divers (only for trips up to 30 April 2019: US$ 150 for 7 nights, US$ 200 for 10 nights), private dive guide. Unless otherwise stated, all the listed items need to be paid on arrival. 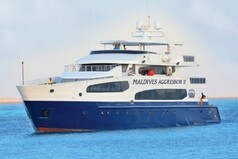 How to get there: MV Carpe Diem's Maldive liveaboard cruises usually depart from Male. On the last night of the trip the boat is moored in the Male harbour. Domestic flights are needed only for Southern and Northern atolls itineraries. Please ask us for more details. Airport transfers are included at check-in time (13:00 hrs) and the afternoon of day 1, plus morning of day 2. Transfers outside this time are US$ 10 per person. For more information see our How to Get to the Maldives section. The last dive of the trip will be at around 11:00 hrs on the second last day of the trip. Please wait at least 18 hours before flying after diving. Single supplement (if you do not want to share accommodation): This is optional - single travellers may choose to share a cabin or pay a supplement of 50% of the published price during summer trips and 80% during winter or discounted itineraries. Dive clubs and group discounts: Pay for 5 guests and 1 guest can join in a Standard cabin free of charge (total 6 guests). 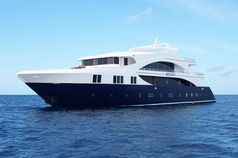 Please refer to the whole boat charter price below, equivalent to pay for 18 guests and 4 additional persons can join the cruise in Standard cabins free of charge (total 22 guests). Rates can be reduced depending on the actual number of passengers, however a minimum of 12 is required to sail. Please check with us. 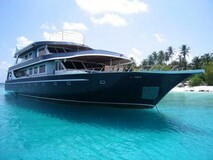 Whole boat charter rate (per night): US$ 3,990, Peak season: US$ 4,950. Fuel surcharge of US$ 1,500. 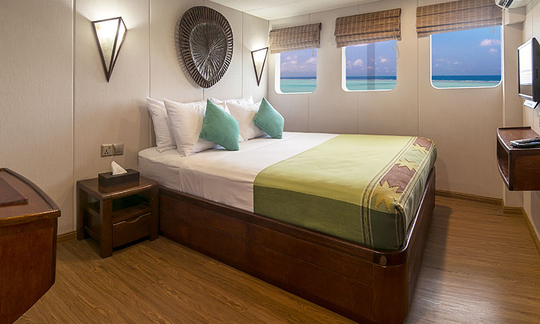 The Carpe Diem offers you 4 different cabin types across 3 decks. 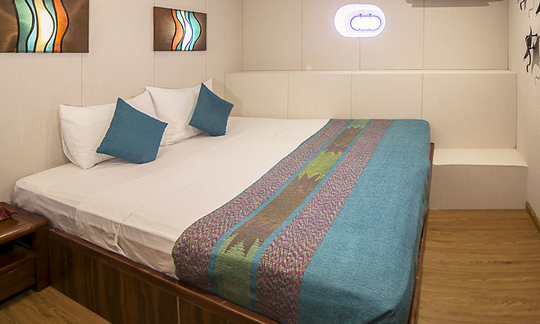 The Suite cabin with its king sized bed is located on the upper deck, together with the Deluxe cabin. 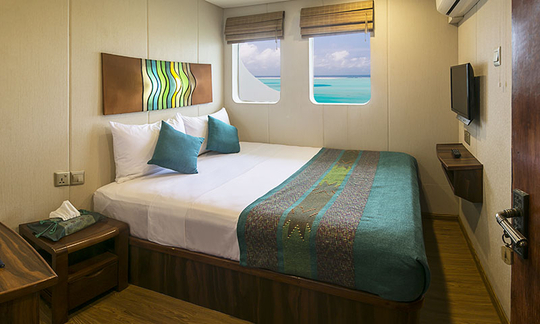 The main deck includes 2 Double cabins, which feature a queen bed, as does the Deluxe cabin. These 4 cabins have multiple windows offering splendid sea views as well as flat screen TVs and DVD / MP3 players. 6 Standard cabins are on the lower deck. 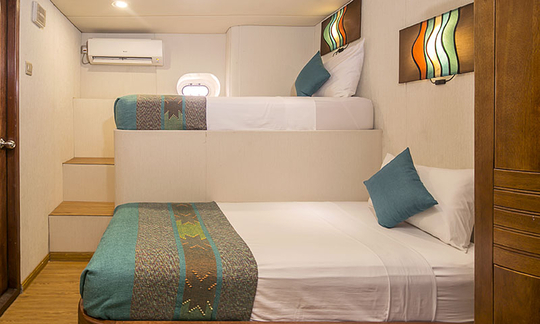 2 Standard cabins have a single bed and a single bunk bed, they are smaller than the 4 spacious Standard cabins with their queen bed and single bunk bed. 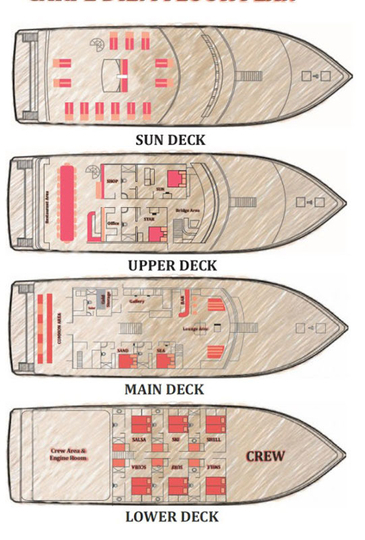 The rooms on the lower deck all have portholes. All cabins have en-suite (private) bathroom facilities. The Suite, Deluxe and Double cabins have their own TV, DVD player and music systems. The Suite also has a fridge. 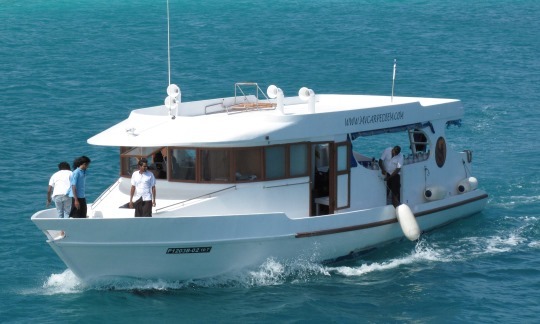 Diving during the cruise is conducted from the dhoni tender. 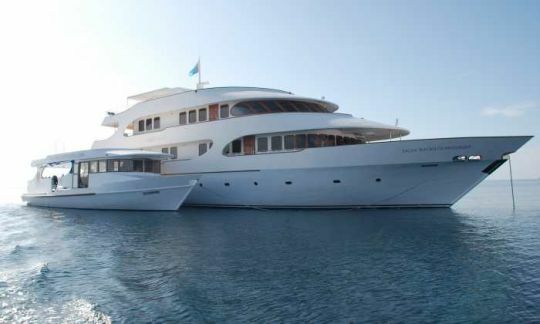 The dhoni is equipped with a toilet and shower as well as ladders, rinse tanks and camera table. 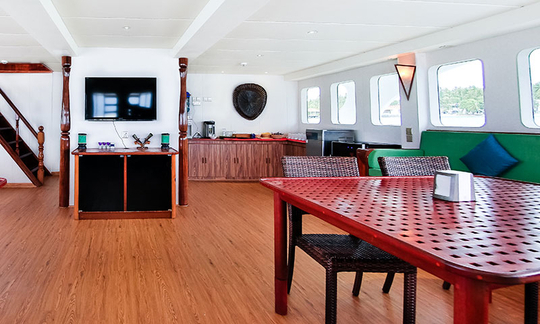 On board the Carpe Diem liveaboard you can expect a wide menu consisting of dishes from a range of cuisines including Maldivian, Thai, Chinese and Italian, as well as international fare and the occasional BBQ. There are always plenty of fresh ingredients used including fresh fruit, vegetables and seafood. Air-conditioned restaurant and open-air dining areas. 3 main dishes per sitting, buffet with waitress service. Coffee, tea and drinking water and fruit are provided free of charge. Soft drinks, fruit juices, milk shakes, mineral water and beer are available for purchase and there is a large cocktail and wine list. The dining service begins with afternoon snacks and evening dinner on the first evening of the cruise. Special dietary requirements can be catered for with advanced notice.